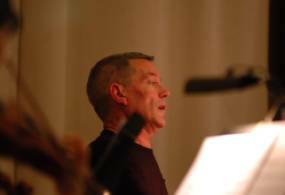 AUDIO; Diffractions mp3 performed by Orchestre 2021 with Jeffrey Grice as soloist, conducted by Nigel Keay. Recording of concert performance, 14th June 2007 in the Grand Salon, Fondation des États Unis, Paris. Full Score published by Waiteata Music Press, Victoria University of Wellington, ISBN 0 908693 76 1, 40 pages (facsimile of original hand-written manuscript). The idea of diffractions is represented in sound by the piano, central and prominent, exploiting an aspect of its technique to which it is ideally suited: rapid changes of direction and wide intervallic leaps with extreme dynamics. The orchestra provides bands of coloured spectra forming an integrated texture. The melody, oscillating and colourful is sometimes pointillistic and at other times it flows into longer continuous phrases. Diffractions is essentially an abstract work in one continuous movement. Diffractions was commissioned by the Dunedin Sinfonia (now called the Southern Sinfonia) with assistance from the Queen Elizabeth 11 Arts Council of New Zealand in December 1986, and was given its premiere performance by that orchestra conducted by Jack Speirs on September 13th 1987 with Terence Dennis as soloist. Diffractions was performed at the 1987 "Sonic Circus" on October 31st by the New Zealand Symphony Orchestra (NZSO) conducted by Francisco Feliciano with David Guerin as soloist. This performance was recorded by Radio New Zealand and broadcast on their Concert FM station. A performance of Diffractions was given at the Nelson School of Music (NZ) by the Nelson Symphony Orchestra in April 1990 (Conductor: Miranda Adams with David Guerin as soloist). Review of the premiere of Diffractions published in the Otago Daily Times (NZ), Monday, September 14, 1987. "The last Dunedin Sinfonia concert of the 1987 series was notable for the significance, quality, and unique features of the music presented. One feature, the world premiere of Diffractions for Piano and Orchestra by this year’s Mozart Fellow at Otago University, was important in the cultural development of the city, whose professional orchestra commissioned the work, and even more important in the career of its composer, Nigel Keay. Provided it is heard by ears tuned to contemporary music, Diffractions’ success cannot be doubted. What it legitimately omits in singable themes and regular rhythm is refreshingly replaced by textures, timbre groupings, and a spread of sound resulting in colourful clusters of harmony interspersed with occasional quieter restful monotones, and presented in an assimilable flow of sound. Keay’s use of serialism and the conventional orchestra was cleverly matched to the idea of breaking up sound waves. Listening to it was intense and gripping. The work seemed brief, perhaps because it was so absorbing. Let’s have an encore soon." - G.F.L. William Dart reviewed the premiere of Diffractions for the New Zealand Listener. This review was published in the October 17, 1987 edition.